Polypropylene Tanks provide excellent chemical compatibility and have continuous use temperatures up to 212 degrees fahrenheit. We have Double Wall Polypropylene Tanks, Vertical Polypropylene Tanks, Open Top Polypropylene Tanks and Rectangular Polypropylene tanks. We rotationally mold Polypropylene tanks. Rotational molding creates one-piece, seamless, stress-free tanks. While these tanks are excellent for many applications, the storage of Sodium Hydroxide is particularly appropriate. Bailiff Enterprises molds large vertical Polypropylene tanks up to 3,000 gallons in size. We make Double Wall Polypropylene tanks up to 2,300 gallons in capacity. A primary tank and a containment tank are sealed together to produce a double wall tank. Open Top Polypropylene tanks are available up to 500 gallons in capacity. Open Top Cone Bottom Polypropylene tanks are available up to 2000 gallons in size. All of our polypropylene tanks are translucent white in color. The Polypropylene tanks that we make are rated to 1.9 specific gravity. That means they are rated to hold liquids that weigh up to 190% the weight of water. We will custom mold polypropylene tanks rated up to 2.2 specific gravity on request. The list below shows all of the Polypropylene storage tanks that we produce. Click on the tank description to see the tank details. 1550 GALLON POLYPROPYLENE VERTICAL TANK 1.9SG VERTICAL POLYPROPYLENE $3745.00 . 1550 GALLON POLYPROPYLENE VERTICAL TANK 1.9SG 87in DIA VERTICAL POLYPROPYLENE $3300.00 . 1,100 GALLON POLYPROPYLENE VERTICAL TANK 1.9SG VERTICAL POLYPROPYLENE $3595.00 . 1,000 GALLON POLYPROPYLENE VERTICAL TANK 1.9SG VERTICAL POLYPROPYLENE $3371.00 . 700 GALLON POLYPROPYLENE VERTICAL TANK 1.9SG VERTICAL POLYPROPYLENE $2150.00 . 500 GALLON POLYPROPYLENE VERTICAL TANK 1.9SG VERTICAL POLYPROPYLENE $1350.00 . 310 GALLON POLYPROPYLENE VERTICAL Tank 1.9SG 44in diameter VERTICAL POLYPROPYLENE $1099.00 . 300 GALLON POLYPROPYLENE VERTICAL TANK 1.9SG 35 INCH DIAMETER VERTICAL POLYPROPYLENE $1045.00 . 160 GALLON VERTICAL TANK POLYPROPYLENE 1.9SG VERTICAL POLYPROPYLENE $699.00 . 120 GALLON PP TANK 1.9SG VERTICAL POLYPROPYLENE $599.00 . 75 GALLON PP TANK 1.9SG VERTICAL POLYPROPYLENE $499.00 . 310 GALLON DOUBLE WALL POLYPROPYLENE VERTICAL Tank 1.9SG 48in diameter VERTICAL POLYPROPYLENE $2590.00 . 140 GALLON DOUBLE WALL POLYPROPYLENE VERTICAL TANK 1.9SG VERTICAL POLYPROPYLENE $1499.00 . 75 GALLON DOUBLE WALL POLYPROPYLENE TANK 1.9SG VERTICAL POLYPROPYLENE $1175.00 . 200 GALLON RECTANGULAR POLYPROPYLENE TANK 1.9SG RECTANGULAR POLYPROPYLENE $1200.00 . 2000 GALLON POLYPROPYLENE OPEN TOP CONE BOTTOM TANK 1.9SG OPEN TOP CONE BOTTOM POLYPROPYLENE $3995.00 . 800 GALLON POLYPROPYLENE OPEN TOP CONE BOTTOM TANK 1.9SG OPEN TOP CONE BOTTOM POLYPROPYLENE $3295.00 . 500 GALLON POLYPROPYLENE OPEN TOP CONE BOTTOM TANK 1.9SG OPEN TOP CONE BOTTOM POLYPROPYLENE $1455.00 . 150 GALLON POLYPROPYLENE OPEN TOP CONE BOTTOM TANK 1.9SG OPEN TOP CONE BOTTOM POLYPROPYLENE $725.00 . 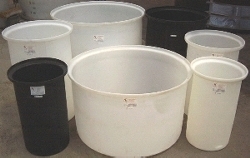 100 GALLON POLYPROPYLENE OPEN TOP CONE BOTTOM TANK 1.9SG OPEN TOP CONE BOTTOM POLYPROPYLENE $500.00 . 50 GALLON POLYPROPYLENE OPEN TOP CONE BOTTOM TANK 1.9SG OPEN TOP CONE BOTTOM POLYPROPYLENE $425.00 . 500 GALLON POLYPROPYLENE OPEN TOP TANK 1.9SG OPEN TOP POLYPROPYLENE $1325.00 . 200 GALLON POLYPROPYLENE OPEN TOP TANK 1.9SG OPEN TOP POLYPROPYLENE $850.00 .